Is Solar Power Worth It in Melbourne? Is solar power worth it in Melbourne? We’re asked this question many times a day, and for most homes and businesses solar makes a lot of sense. What are the options for Victorians who are thinking about installing solar, and do they really pay off? If you’ve done any research into solar pricing you will have seen some unbelievable deals advertised. And unbelievable is exactly what they are. Cheap Panels, cheap inverter, and a cheap installation. Cheap Chinese imports like these cost less up front, but they most likely will not perform like a good-quality system and won’t give you the same savings over the years that follow. It’s safe to say that this type of solar isn’t worth it. In 2017 the Clean Energy Council discovered that 1 in 5 systems failed inspection and needed to be decommissioned. It also found that an incredible 78% of all panels installed in Australia couldn’t produce the amount of power they were rated for and that almost half had bad-quality components substituted into them. These problems are widespread where manufacturers and importers don’t put in the effort to closely monitor every aspect of the products they’re getting. Ads for low-quality systems often include words like ‘tier 1’ and ‘top solar company’, but as Choice warns consumers, “extremely cheap sale offers like this are a big red flag, and the products are likely to give you problems within a few years. They’re also likely to be installed in a rush, leaving you with the possibility of parts breaking down and even causing safety issues”. Be extremely wary of short warranties on workmanship (less than 5 years), and anyone who won’t assess your property for shade, angle etc before giving you a quote. Warranties are also only worth anything if your installer stays in business! The solar industry is notorious for short-lived companies leaving their customers without support. ASIC lists an incredible 650 solar companies that have closed, gone into liquidation/administration or similarly left the market since 2011, and it’s estimated that one-third of Aussie solar systems are ‘orphaned’ by their installers, which means that they will not be able to access any system support for warranty claims. Your choice of solar installer is what makes your solar investment good value. A good quality, properly installed solar system pays off to a degree that surprises many people. With two rebates slashing the cost of solar products in Victoria, these good quality systems are more affordable than ever. Take an average 5kW solar system, for example. The federal government’s Small-Scale Renewable Energy Scheme (SRES) is over $2600, lowering the purchase price at which the system is sold. Eligible Melbourne buyers can then also claim the state government’s Solar Homes rebate, which covers up to half of the remaining cost up to $2,225. To take advantage of both rebates, you’ll need to act quickly; the state scheme is funded for its first phase so far, which runs until June 2019. Based on the average numbers, that 5kW system is capable of cutting $414 off your quarterly power bills if you use 70% of the solar power as it is generated, which means the system can pay for itself off in as little as 3-5 years. Depending on your power needs, larger or smaller systems also offer significant savings. While a majority of homes can benefit from solar power, Solaray usually recommends that to get a significant saving out of solar your quarterly power bill should be at least $400. The smallest system we typically install is 2kW, which can save up to around $200 if you use everything it generates. As a ballpark number, each kW of solar capability you install will save you up to around $100 per quarter if you’re able to use most of the solar power in the home as it is generated across the day, or store the excess in a battery to use in the evening. The more power your household consumes, the easier it is to save by installing a solar power system. If you generate more solar power you can use, you’ll find a credit on your power bills of around 12 cents per kWh for the energy you’ve fed back into the grid, although the financial benefit isn’t as great as the saving you make by using the solar. The feed-in tariff is a part of the agreement you have with your energy retailer, and we would be happy to recommend Energy Locals if you are looking for a great deal with a high feed-in tariff. If the bulk of your electricity use is outside daylight hours, then adding a battery to your solar system can be a great way to use more of your excess solar power. Battery technology has come a long way recently, and it’s now possible to save the solar you don’t use during the day to keep things running overnight instead of relying on the grid once the sun’s set. The batteries Solaray offers range from the smaller 2.4kWh Enphase Energy Management System to your personal version of Elon Musk’s Tesla mega battery, the 13.5kWh Tesla Powerwall 2. Both are high-quality products with advanced online monitoring that make it easy for you to see how much energy you’re generating and how much you’re using. 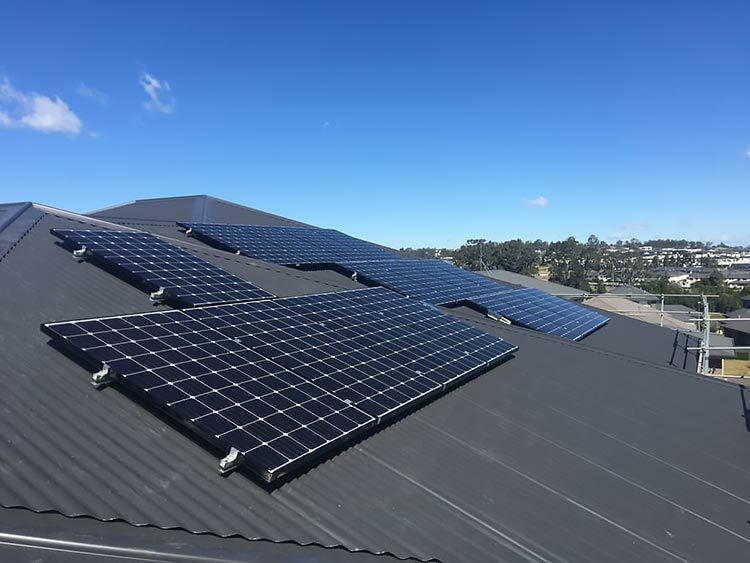 For more information about this and how to accurately size up a battery ready solar system for your Melbourne property, request a quote today. So Is Solar Power Worth It In Melbourne? Generally, solar power will be a great investment that can significantly reduce your power bills for decades. In fact, a 5kW solar system can save you up to around $50,000 over the 25-year life of the system and can be the single most effective way to reduce your carbon footprint. If you’re only prepared to buy the cheapest system, then there is a good chance your solar isn’t going to prove itself to be a great investment. On the other hand, if you select quality solar products it’s possible to save a significant amount of money while also reducing your carbon footprint for decades to come.